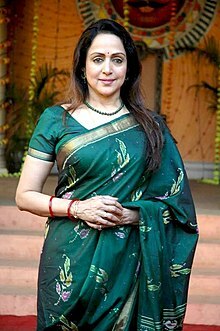 Hema Malini (born 16 October 1948) is an Indian actress, writer, director, producer, dancer and politician. In 1962, she made her acting debut in the Tamil film Ithu Sathiyam. Malini first acted in a main role in Sapno Ka Saudagar (1968), and went on to feature in numerous Bollywood films, primarily as the lead actress. In most of her films, she starred opposite her husband Dharmendra and with Rajesh Khanna and Dev Anand. Malini was initially promoted as the "Dream Girl", and in 1977 starred in a film of the same name. She has played both comic and dramatic roles, as well as being a dancer. She has appeared in more than 150 films. During her career, she received eleven nominations for the Filmfare Award for Best Actress, winning the award in 1973. In 2000, Malini won the Filmfare Lifetime Achievement Award and also the Padma Shri, the fourth-highest civilian honour awarded by the Government of India. In 2012, the Sir Padampat Singhania University conferred an Honorary Doctorate on Malini in recognition of her contribution to Indian cinema. Malini served as chairperson of the National Film Development Corporation. In 2006, Malini received the Sopori Academy of Music And Performing Arts (SaMaPa) Vitasta award from Bhajan Sopori in Delhi for her contribution and service to Indian culture and dance. In 2013, she received the NTR National Award from the Government of Andhra Pradesh for her contribution to Indian cinema. From 2003 to 2009, Malini was elected to the Rajya Sabha, the upper House of parliament, as a representative of the Bharatiya Janata Party. In 2014, Malini was elected to the Lok Sabha. Malini has been involved with charitable and social ventures. Currently, Malini is also a life member of the International Society for Krishna Consciousness (ISKCON). She was the top successful actress of her time. She has been praised by critics for her dancing and acting. Malini was the third child born of a Tamil family to her mother Jaya Lakshmi Chakravarti, a film producer, and VSR Chakravarti. Malini attended the Mahila Sabha in Chennai where her favourite subject was history. Malini studied at DTEA Mandir Marg , and in 11th Standard she left to begin her acting career. Malini's first film with Dharmendra was Tum Haseen Main Jawaan (1970), and they got married in 1980. Dharmendra was already married at the time and had children, two of whom are Bollywood actors Sunny Deol and Bobby Deol. Malini and Dharmendra have two children, Bollywood actress Esha Deol (born 1981) and Ahana Deol (born 1985), an assistant director. Malini's niece is actress Madhoo Raghunath, who played the female lead in Phool Aur Kaante (1991), Roja (1992) and Annayya (1993). On 11 June 2015, Hema Malini became grandmother when her younger daughter Ahana Deol gave birth to her first child, Darien Vohra. On 20 October 2017, she became grandmother for the second time when her elder daughter, Esha Deol Takhtani gave birth to a baby girl. Baby was born in Hinduja Hospital in Mumbai and was named Radhya Takhtani. Hema was a supporting artiste in Idhu Sathiyam (1962) and portrayed as danseuse in Pandava Vanavasam (1964). In 1968, Malini played opposite Raj Kapoor in Sapno Ka Saudagar. That was the beginning of her career and promotion as the "Bollywood dream girl." In Johnny Mera Naam (1970), Malini took a lead role and she took other challenging roles, for example, a young widow in Andaz (1971) and a jealous woman in a negative character in Lal Patthar (1971). In 1972, Malini played opposite Dharmendra and Sanjeev Kumar in Seeta Aur Geeta. Malini received a Filmfare Best Actress Award for this film. Within four years of making her début, Malini was an established lead actress in Bollywood and classical dancer. Malini's films of the 1970s include Sanyasi (1975), Dharmatma and Pratigya (1975). In Sholay (1975), Malini played the role of Basanti, a talkative girl. Other works of the period include Trishul, Joshila, Khushboo (1975), Kinara (1977) and Meera (1979). Malini performed with Dharmendra in 28 films including Sharafat, Tum Haseen Main Jawan, Naya Zamana, Raja Jani, Seeta Aur Geeta, Patthar Aur Payal, Dost (1974), Sholay (1975), Charas, Jugnu, Azaad (1978) and Dillagi (1978). Her screen presence and chemistry with Rajesh Khanna was appreciated in the film Prem Nagar (1974 film). Malini portrayed the role of a classical singer in the critically acclaimed film Mehbooba opposite Rajesh Khanna, and the Times of India called them one of the top film couples. The subsequent films of the pair; Palkon Ki Chhaon Mein and Janta Hawaldar became box office flops on their release, though over the years these films have achieved cult status. After her marriage, Malini made films including Kranti, Naseeb (1981), Satte Pe Satta, Rajput, and Ek Nai Paheli (1984). Her works also included Aandhi Toofan, Durgaa (1985), Ramkali (1985), Sitapur Ki Geeta (1987), Ek Chadar Maili Si (1986), Rihaee and Jamai Raja (1990). During this period, Malini performed with Dharmendra in Alibaba Aur 40 Chor, Baghavat, Samraat, Razia Sultan, Andha Kanoon (1983), Baghavat, and Raaj Tilak (1984). Her commercially successful films, after 1980, with Rajesh Khanna included Dard, Bandish, Kudrat, Hum Dono, Rajput, Babu, Durgaa, Sitapur Ki Geeta and Paap Ka Ant. In the 1990s, she produced and directed the 1992 film Dil Aashna Hai, starring Divya Bharti and Shahrukh Khan in the leading roles. She also produced and directed her second feature film Mohini (1995), starring her niece Madhoo and actor Sudesh Berry in the leading roles. She then focused on dancing and television work, only occasionally appearing in films. In 1997, she acted in Vinod Khanna's production Himalay Putra which marked the debut of Vinod's son Akshaye Khanna. After taking a break from films for a number of years, Hema made a comeback with Baghban (2003), for which she earned a Filmfare Best Actress Award nomination. She also made guest appearances in the 2004 film Veer-Zaara and the 2007 film Laaga Chunari Mein Daag. In 2010, she acted in Sadiyaan alongside fellow veteran actress Rekha. In 2011, she produced and directed her third feature film Tell Me O Khuda which featured both her husband Dharmendra and her daughter Esha Deol, which was a box office failure. In 2017 She acted in the film Ek Thi Rani Aisi Bhi in the role of Vijaya Raje Scindia of Gwalior, with Vinod Khanna as her husband, unfortunately it was Vinod Khanna's last film. The film was directed by Gul Bahar Singh. The film was released on 21 April 2017. In 1999, Malini campaigned for the Bharatiya Janata Party (BJP) candidate, Vinod Khanna, a former Bollywood actor, in the Lok Sabha Elections in Gurdaspur, Punjab. In February 2004, Malini officially joined the BJP. From 2003 to 2009, she served as an MP to the upper house – the Rajya Sabha, having been nominated by the then President of India, Dr. A.P.J. Abdul Kalam. In March 2010, Malini was made general secretary of the BJP, and in February 2011, she was recommended by Ananth Kumar, the party general secretary. In the 2014 general elections for the Lok Sabha, Malini defeated the Mathura incumbent, Jayant Chaudhary (RLD) by 3,30,743 votes. Malini was then elected to the Lok Sabha. On 22 April 2017, Malini said she would take action against Maharashtra independent MLA Omprakash Babarao Kadu for making derogatory comments against her earlier days. Malini is a supporter of the animal rights organisation, PETA India. In 2009, she wrote a letter to the Mumbai Municipal Commissioner urging him to ban horse carriages from Mumbai`s busy streets. In 2011, she wrote to the Union Minister for Environment and Forests, Jairam Ramesh, urging him to ban bull fighting (jallikattu). She said, "My friends at PETA have organised investigations at jallikattu events and documented that bulls are pulled roughly by their nose rings, punched, pummelled, hit with sharp sticks and crammed into trucks so tightly that they can barely move". Malini won the title of "PETA Person of the Year". As a vegetarian, she said, "Knowing that my food choices are helping the planet and animals too, makes me happy". Malini is a trained Bharatanatyam dancer. Her daughters Esha Deol and Ahana Deol are trained Odissi dancers. They performed with Malini in a production called Parampara for charitable events. She also performed with her daughters at the Khajuraho Dance Festival. Malini studied Kuchipudi with Vempati Chinna Satyam and Mohiniattam with Kalamandalam Guru Gopalakrishnan. She has played a number of dance roles including Narasimha and Rama in Tulasidas's Ramcharitmanas. In 2007, she performed in Mysuru on the eve of Dussera, where she played the roles of Sati, Parvati and Durga. Malini owns the Natya Vihar Kalakendra dance school. Malini has appeared in television serials such as Jai Mata Ki (2000), directed by Puneet Issar. She played the role of goddess Durga. Other television series appearances include Kamini Damini on Sahara One where she played twin sisters and Noopur which Malini directed and in which she played a Bharatanatyam dancer. Malini was the editor of New Woman and Meri Saheli, Hindi women's magazine. In 2000, Malini was appointed as the first female chairperson of the National Film Development Corporation for a term of three years. In 2007, Malini entered a promotional contract with Kent RO Systems, makers of a mineral water purifier system. Malini also became a brand ambassador for Pothys, a textile showroom in Chennai. ^ "rediff.com: A dream called Hema Malini". Rediff.com. 16 October 1958. Retrieved 14 June 2011. ^ title=Hemaji Hemamalini, ever dream girl turned 65. cinemanewstoday.com. ^ a b A dream called Hema Malini. Rediff.com. Accessed 24 September 2009. ^ a b Abhinetri (1970) The Hindu 3 December 2010. Accessed 30 June 2011. ^ Friday Review Chennai / Tribute : Bollywood's macho man bids goodbye. The Hindu 1 May 2009 Accessed 14 June 2011. ^ Top Box Office Draws of Indian Cinema. IBOS. Accessed 24 September 2009. ^ "Filmfare Awards". imdb. 1973. Retrieved 20 July 2017. ^ Padma Vibhushan, Padma Bhushan, Padma Shri awardees. The Hindu 27 January 2000 Accessed 14 June 2011. ^ Here comes Dr. Hema Malini! Archived 17 October 2012 at the Wayback Machine The Times of India 2 October 2012. Accessed 2 October 2012. ^ Correspondent, Special. "S.P. Balasubrahmanyam, Hema Malini bag NTR awards". ^ "My dad opposed my marriage: Hema". IBNLive.com. Retrieved 21 February 2016. ^ Hema Malini. Living Media International Limited 2004 p23. ^ My Fun Days. Telegraph India 29 June 2011. Accessed 6 July 2011. ^ a b Detailed Profile, Smt. Hema Malini, Members of Parliament (Rajya Sabha), Who's Who, Government: National Portal of India. India.gov.in Accessed 6 July 2011. ^ "Hema Malini-Biography, Career, Awards and Net Worth". 20 May 2017. ^ "Hema Malini Drives into Mathura Nagari". New Indian Express. 2 April 2014. Retrieved 18 June 2016. ^ "From Hema Malini-Dharmendra, Rekha-Vinod Mehra to Aamir Khan-Reena: Bollywood's most controversial and secret marriages". Daily News and Analysis. 3 January 2014. Retrieved 18 June 2016. ^ Joshi T. Ahana Deol and boyfriend VJ Aditya working together in Guzaarish. Mid-day.com 26 May 2009 Accessed 6 July 2011. ^ Metro Plus Mangalore, Cinema : Sister act! The Hindu 10 October 2009 Accessed 6 July 2011. ^ Next in line. The Telegraph, Kolkota. 3 March 2011. Accessed 6 July 2011. ^ "First Child". Times Of India. Retrieved 25 October 2017. ^ The Winners – 1972– The 51st Filmfare Awards. The Times of India. 14 June 2011. ^ Biography reveals dream girl's love affairs. Paktribune.com Accessed 1 July 2011. ^ Goddess of valour. The Hindu 25 March 2011. Accessed 30 June 2011. ^ Pawar Y. Kamal Haasan and Rajinikanth’s guru K Balachander passes away. DNA 21 June 2012 Accessed 27 December 2014. ^ Kalyani Prasad Keshri (26 July 2010). "Dream Girl | Esha Deol". Entertainment.oneindia.in. Retrieved 4 December 2011. ^ "Hema Malini's Diwali wish for Tell Me O Khuda". Hindustan Times. 25 October 2011. Archived from the original on 28 November 2011. Retrieved 4 December 2011. ^ a b Hema Malini joins BJP. The Hindu 20 February 2004 Accessed 14 June 2011. ^ a b Karnataka News : BJP picks Hema Malini for RS. The Hindu 19 February 2011 Accessed 14 June 2011. ^ Hema Malini makes dream debut in Mathura. Zeenews 2014. ^ Constituency wise. ECI results. ^ "Hema Malini to take action against Maharashtra MLA - Times of India ►". The Times of India. Retrieved 2018-09-23. ^ Ban Tamil Nadu's jallikattu: Hema Malini. Times of India 4 July 2011. ^ Hema Malini urges ban on Tamil Nadu's Jallikattu. [dead link] IBN Live 1 July 2011. ^ Hema Malini named PETA Person of the Year. Deccan Herald 19 December 2011. ^ Hema Malini stars in PETA ad. Times of India 9 October 2013. ^ Star daughter awaits a big hit, The Hindu 16 June 2002 Accessed 14 June 2011. ^ Friday review Hyderabad / Dance : Goddess of valour. The Hindu 25 March 2011 Accessed 14 June 2011. ^ Hema Malini mesmerises at Khajuraho Dance Festival. The Hindu 3 February 2011. Accessed 6 July 2011. ^ Friday review Hyderabad / Dance : Hema's celestial dance recital. The Hindu 7 April 2006 Accessed 14 June 2011. ^ Kumar K. Hema Malini presents 'Durga' to a standing ovation. The Hindu 22 October 2007. Accessed 6 July 2011. ^ Hema Malini enthrals audience. The Hindu 13 September 2010. Accessed 25 June 2016. ^ Godly choices. The Sunday Tribune 30 March 2003. Accessed 10 January 2012. ^ India as a writer's market. Writing-world.com Accessed 1 July 2011. ^ Which business family owns Outlook? Rediff.com 1 July 2011. ^ Are You surprised? Rrtd.nic.in 15 October 2000. Accessed 6 July 2011. ^ Business : Kent RO aims to consolidate market position. The Hindu 20 February 2009. Accessed 6 July 2011. ^ Tamil Nadu / Chennai News : Prizes distributed to winners of 'Pothys Pattu Parisu'. The Hindu 31 December 2010. Accessed 6 July 2011. Bhawana Somaaya (2007). Hema Malini: The Authorized Biography. Lotus Collection. ISBN 978-81-7436-467-8. Raheja, Dinesh. "Hema Malini: Bollywood's Dreamgirl". Rediff. Retrieved 15 June 2011. Wikimedia Commons has media related to Hema Malini.